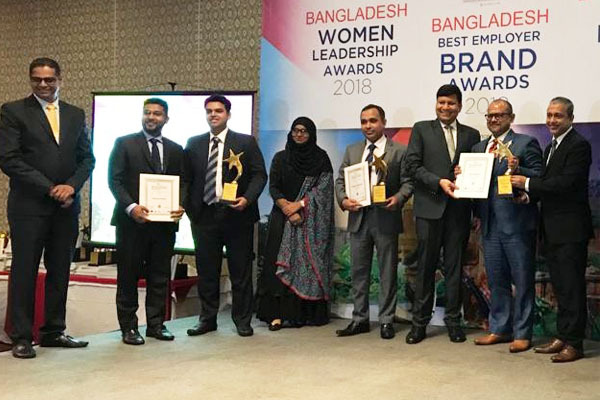 aamra companies is recently acknowledged as the ‘Best Employer Brand in Bangladesh’ for the year 2018 which is accredited jointly by World HRD Congress and CHRO Asia. aamra companies, a diversified technology conglomerate, received this acknowledgement at 14th Employer Branding Awards 2018, held at Radisson Blue Dhaka Water Garden, Bangladesh on 23rd September, 2018. This is aamra’s 9th award from World HRD Congress and CHRO Asia in a row since 2015.
aamra companies’ Group Chief People Officer (GCPO), Ajeyo Rohitashwo ~ Al Quazi, was also awarded with ‘HR Leader with Vision’ for his contribution to HR fraternity locally & internationally. Presently Ajeyo is ranked as number 1 HR Professionals in Asia Pacific for his contribution in aligning HR with technology, write up, thoughts & concepts on 4 IR.